Pupils were given a Road Safety talk by someone from Essex County Council. 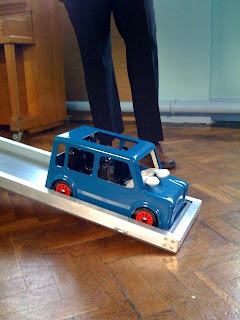 They brought along a model car and ramp which showed the effect of not wearing a seat belt after a collision at just 10mph. When the presenter asked the children how many of them don't wear a seat belt regularly, about 5 hands went up. That's about 20% of the class. It was staggered by the statistic when it is so well known how seat belts save lives. Incredible. Pupils were clearly fascinated by the model. They all wanted to have a go which would have made the demonstration perhaps a bit more hands-on and bring about greater opportunity to remember some of what had been mentioned during the presentation.